The Committee are not aware that any change or want of zeal or activity in the discharge of his duties (so far as he acquainted with it) has ever been established against the Chief of Police but there can be no doubt that he has not that authority over his men or that degree of experience which is absolutely essential to enable him to enforce a proper system of order and discipline. The City’s committee on the Circus Riot had recommended in 1855 that the London Police be approached for a candidate from that force to take charge in Toronto. 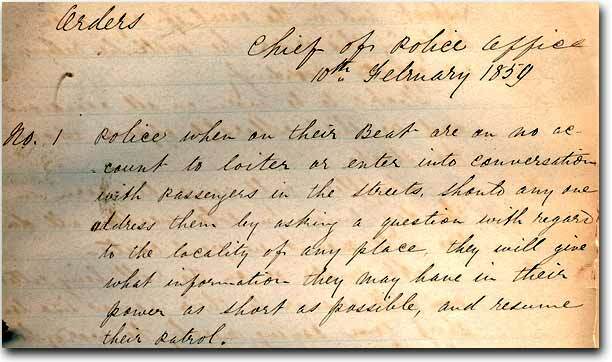 But when it came to hire a Chief for the new force in 1859, Toronto instead chose a military officer and not an experience police officer from the London Police. 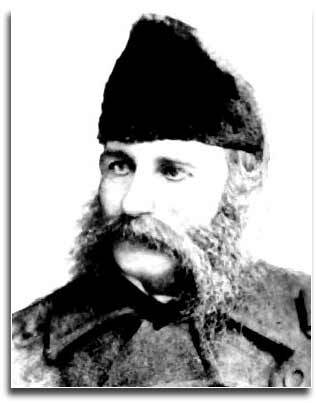 The new Police Chief was William Stratton Prince, a former Captain of the 71st Highland Light Infantry. There is a remarkable paucity of biographical detail on Prince and detail on how his candidacy and appointment unfolded. His regimental history, however, hints at the qualifications that Prince brought to the job. The 71st Highland Light Infantry was first formed in Glasgow in 1758 and was for the next century one of Britain’s most battle hardened regiments. It fought in America during the War of Independence. The regiment served under Lord Cornwallis in the Carolinas and Virginia, and was included in the surrender at Yorktown, 17th October, 1781; 1782-83 it fought in Southern India; Fought at Conjeveram, Porto Novo, Sholinghur, Vellore, Cuddalore, and Arcot; 1790-1 campaigns against Tippoo Sahib, siege of Pondicherry, Bangalore, Seringapatam; 1805-06 assault landing at the Cape of Good Hope and the battle of Blauberg; 1806-07 assault and capture of Buenos Aires; 1808-09 First Peninsular Campaigns; 1809 Walcharen Expedition; 1810-14 Second Peninsular Campaigns; 1815 at Waterloo took part in breaking the last charge of Napoleon’s Old Guard; Army of Occupation, France 1815-17 : England and Ireland 1818-23 : Canada 1824-30 : Bermuda 1831-33 : Scotland and Ireland 1834-37: Canada, suppressing rebellion and preventing American infiltration attempts 1838-42 : West Indies 1843-46 : England, Scotland and Ireland 1847-52 : Corfu 1853-54. The Board also reported, “In the opinion of the Commissioners no division of labour which provides less than three changes or reliefs in every 24 hours can be accomplished without greatly endangering the efficiency as well as the health and life of the police forces.” Toronto finally had a municipal night watch. As previously pointed out, only half of the old Toronto Police Force were rehired and most were post-Circus Riot recruits, hired under Toronto’s unilateral board of commissioner “experiment” of 1857-58 prior to the Province’s amendment of the Municipality Act. Fifty-eight constables were actually hired, of which 5 were Presbyterian, 8 Roman Catholic including one of the three Sergeant-Majors, while the remaining 45 were Anglican Episcopalians. At least forty-two constables were Irish, but the nominal and descriptive roll is illegible in portions and a final tally is difficult to determine. 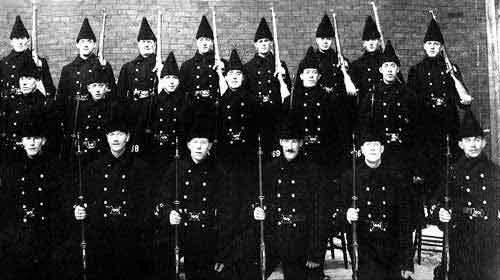 (The slightly modified force of the following year shows forty-four Irish constables in a force of 56.) Eight had served in the military, while 19 served on other British police forces, the majority in the Irish Constabulary. The propensity was to hire constable from outside the community of Toronto. No. 1 Police when on their Beat are on no account to loiter or enter into conversation with passengers in the streets. Should any one address them by asking a question with regards to the locality of any place they will give what information they may have in their power as short as possible, and resume their patrol. The men of the Force are given to understand that they are not permitted to lodge at hotels on any account whatever. Constables must have their own private lodgings and on no account be seen lounging and talking about bar rooms and public houses. It will be the duty of the non-commissioned officer to see that their men reside at the houses of respectable parties. New appointments will also report personally to the Chief the name of the parties they board with and the street and number of the house. The Force are again reminded that residence in saloons and public houses will not be permitted. The Chief Constable requests the Constables on taking their meals will be respectfully dressed or, he will issue an order to enforce it, he trusts that the majority of the constables out of respect for themselves and what is due to the respectability of the Force, will report to the Chief Constable any constable guilty of an act of gross indecency of this kind, as sitting down with his coat off as conduct of this kind is nothing more or less than a disgrace to the force and will be treated as such. Should be in the prime of manhood, mentally and bodily; shrewd, intelligent and possessed of a good English education; trustworthy, truthful, and of a general good character, in order to command a moral as well as an official influence over those among whom he may be required to act, and subject to the most rigid discipline; he should, in fact, be a man above the class of labourers and equal, if not superior, to the most responsible class of journeymen mechanics. The position of "attention" that position which the officers and constables will present at all times in addressing the Bench, and in giving evidence and indeed at all times on being questioned on points of duty, is as follows: The heels must be in a line and closed -- the knees straight -- the toes turned out so that the feet may form an angle of 60 degrees -- the arms hanging straight down for the shoulders -- the elbows turned in and close to the sides -- the thumb kept close to the forefinger -- the Head to be bent and in giving evidence the body, arms and hands to be perfectly steady -- in fact -- exactly the same position as a soldier in the Ranks or parade addressing his Officer. In the arrest of criminals and disorderly characters, drunkards, especially the latter, men are cautioned against the unnecessary use of the baton when persuasion and a little patience on the part of the policeman would suppress all violence on the part of those arrested. P.C. Taylor was suspended and brought before the commissioners of police to answer to a complaint preferred against him for having wantonly used violence to a woman of bad character in Church Street by giving her a kick. The commissioners find the complaint is correct and caution the said constable to be more careful for the future. Violence is not on any account to be used except in self defense or in prisoners resisting - and it is absurd to a degree that constables should loose all control over their tempers on being abused by a drunken woman. Constables are supposed to be above caring for abuse from persons of that description. The following is the order in which street firing is conducted, and in order that men should have a theoretical knowledge of the same as well as practical, the following is a description of the drill with regard to clearing streets. The company being in column of subdivisions -- the commander of the leading subdivision will give the word, "Right (or left) Subdivision" "Ready" "Present" "Shoulder Arms" "Four Deep" and remain steady. The commander of the rear subdivision at the same time giving the following words of command "Rear Subdivision" "Four Deep" "by the left, Quick March." The subdivision will then advance passing through the opening of fours of the Front subdivision and when advanced 20 paces will halt. The commander of the right subdivision will immediately on the left passing through it, give the word of command, "Front" "Load" then "Shoulder Arms" "by the left, Quick March” whilst the commander of the then leading subdivision immediately on the rear one receiving the word Quick March, will give the word of command, "left Subdivision" "Ready" "present" "Shoulder Arms" "Four deep" -- and the right subdivision forming four deep advancing, will proceed through the left halting at 20 paces in front, the rear subdivision at the same time loading as before directed, and thus the subdivisions will advance and fire alternately. For new reformed Toronto Police in the 1860s, proactive crime fighting was less on the agenda then the preparedness for meeting mass hostile threats emanating from within the city. Where the threat was perceived to come from has already been described above. The street skirmishing drill, prepared specially also for the Toronto Police Force, is peculiarly a Police drill. The expeditious movement of sections or small detachments in close or extended order from point to point with the fewest possible words of command is the object sought to be attained. A section or any portion of a company can be extended or moved to cover a given point almost instantaneously on a single word of command, and as readily reformed, without any regard to the position occupied by the front or rear ranks. All movements are executed on the double, and have been studied out with a view to a more speedy and effectual suppression or riots and street disturbances. Nonetheless, despite the constant drilling, Toronto Police never came to use the massive firepower it had available to deploy. 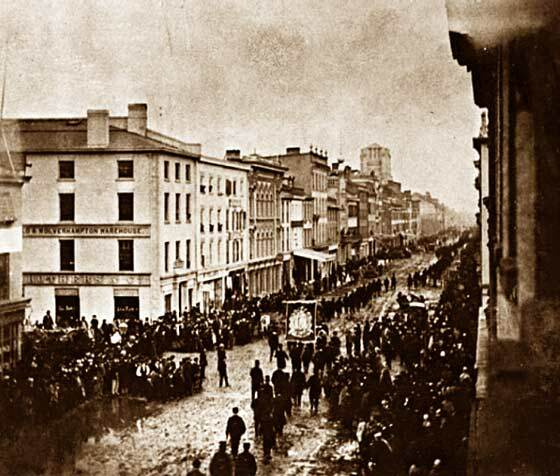 Probably the seminal event in Toronto’s Police history, both for its reservation in using mass force and for its relationship to the Irish Catholic populace, is the Procession Rioting of 1875. 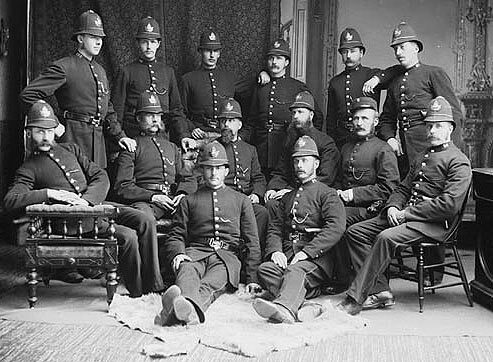 As it was noted above, the newly reformed Toronto Police remained predominantly Irish Protestant. The issue of the Orange Order membership in the Police was not immediately resolved. The Police Commissioners originally ruled in 1859 that no member of a secret society might join the force. Pressured publicly by the Orange Order, City Council attempted to overturn the ruling but failed by one vote. The next year when the Tories returned to dominate City Council the vote was taken again and passed, but the Board of Police Commissioners insisted that City Council had no authority to rescind the Board’s regulations, and the order stood and was formally incorporated into the Toronto Police Regulations. freeze motion in a short exposure time dates the photo to no earlier than the late 1860s. While the Irish Catholic population was already singled out as a threat within the city by virtue of their home history, poverty, ethnicity, and unskilled labour status, the Fenian Raids and D'Arcy McGee’s assassination in Ottawa, further cast aspersions on the Irish Catholics and positioned them as targets of police attention. 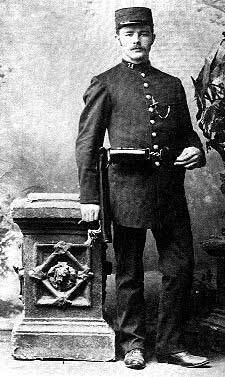 The mostly Protestant Toronto constables were often accused of acting with prejudicial hostility towards Irish Catholics. But in 1875 during huge Catholic processions in Toronto which came under attack by armed Orange mobs, the Toronto Police distinguished themselves not only in their defense of the Catholics, but also for the coolness in the face of the mobs. Despite numerous handgun shots and thrown rocks, the police did not return fire and several constables sustained injuries protecting the Catholic procession. The archdioceses conducted a large cash collection on behalf of the constables in gratitude, and the issue of systemic Toronto Police hostility towards Irish Catholics was put to rest that year. When in 1878, American Fenian O’Donovan Rossa visited Toronto to speak at St. Patrick’s Hall, Toronto Police efficiently and coolly protected him from angry Orange mobs. In the future, the potential military might of the Toronto Police was increasingly directed towards threats from labour unions, as it was against workers during the Street Railway Company Strike in 1886. While Orange vs. Green clashes in the streets diminished, the Toronto Police were still not about to be deployed as the proactive anti-crime force we associate with municipal policing today. Ibid, Appendix 7, Descriptive and Nominal Roll of the City of Toronto Police Force 1859. Ibid, 1859, Appendix 7, Descriptive and Nominal Roll of the City of Toronto Police Force 1859. Toronto City Council, Minutes, 1869, Appendix 4, page 7. Toronto Chief Constable, Order Book 1861-1862, Toronto Police Service, 17 June 1862 (hereinafter Order Book II). Order Book II, 16 July 1862.